Note the bright yellow eye contrasting with the black head. The white flanks on this bird are showing signs of eclipse plumage. 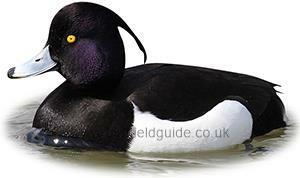 The Male Tufted duck in Winter is a distinctive black and white duck with a tufted head. It's eye is bright yellow and it's bill is bluish with a black tip. 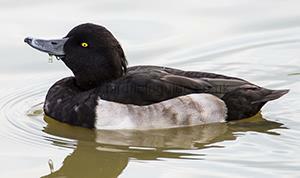 The Tufted duck is a diving duck. A widespread bird, resident throughout most of the UK and central Europe. Around 17,000 pair breed in the UK. Numbers increase when Northern European birds arrive in Winter peaking to around 110,000 birds. The Tufted duck dives for it's food, regularly disappearing under the water. It's typical food is molluscs, insects and small fish. 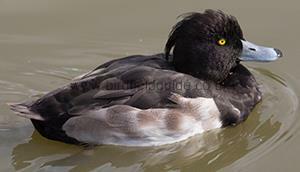 The Tufted duck nests in long grass around freshwater lakes and large ponds. In Winter it can be found in large flocks on open freshwater, especially near the coast. In Summer the Males white flanks become much browner, sometimes much darker than the image above. The body becomes more of a brown-black but is always much darker than the female. The birds tuft gets less pronounced but it is always present. The Female Tufted duck is an all brown bird, the flanks are a lighter brown and can be distinctive, even from a distance. The Female has the same bright yellow eye as the Male.